A former Chemical Works active since the turn of the century and involved in the production of various chemicals including solvents, general hydrocarbons, heavy oil fractions and tar distillation. It was proposed to redevelop the site for housing and VertaseFLI was contracted to undertake the remedial works. The site had been impacted by BTEX, PAH’s, diesel and general hydrocarbons. In addition, there were areas of tar contamination in both solid and liquid state. Vertase was responsible for all remediation works required in order to ensure the site was suitable for a housing development that could utilise shallow spread raft foundations. This involved re-engineering the upper 1.5m of cohesive made ground (and deeper soft spots / contamination as required), removing solid tar contamination and treating all other soils on site. 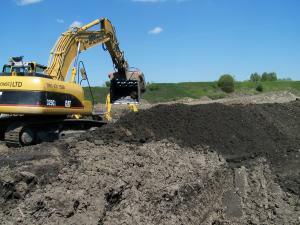 Prior to re-use, the soil was broadly classified in-situ, segregated, prepared by screening and/or crushing, biologically treated, re-classified and then re-engineered to finished levels. During the works, the made ground was dewatered, and all water and effluent was passed through a purpose built water treatment plant, situated on site. A temporary groundwater barrier was installed prior to the main works in order to isolate the groundwater, collect and recover free product and prevent the migration of contaminated waters from offsite migration. Following completion of the excavation of each site zone, an in-situ groundwater treatment system was designed and installed to treat dissolved phase hydrocarbon contamination. 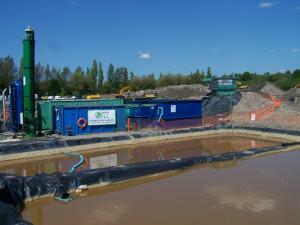 110,000m3 soils were re-engineered, and over 100,000m3 of soils were subjected to ex-situ bioremediation.